I wouldn't be surprised if you have not seen this film yet. It isn't exactly the type of film most people go to watch unless you drink water out of mason jars and eat only 100% organic foods. Gender and sexuality equality seems to have that stereotype attached to it and most people don't want to be associated with it. But you need to remember that it's also important and this film should be seen to be aware of how far we've gotten and how far we still have to go for gay rights. 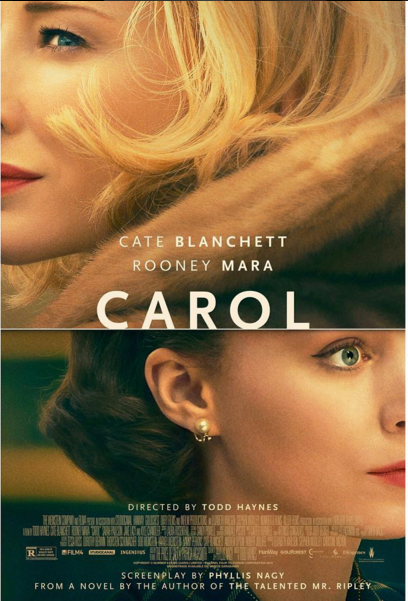 It's based on a novel by Patricia Highsmith that was originally called 'The Price of Salt' and later republished as Carol. The 1952 novel was one of the first to show content of lesbian and instil a happy ending for them. The movie was amazing! The scenes were all so elegant and well placed. With awards to surely be placed in the 2016 Golden Globes as it has been nominated for 5 various awards the film is picturesque. The two main characters played by Rooney Mara and Cate Blanchett play their roles perfectly as they depict a loving mother in a custody battle with her soon-to-be ex-husband, and an awkward and beautiful set designer (in the film she is a photographer). The film really showed how hard it must have been - and still is- to be in a homosexual relationship. The secrecy that they have to keep in order to continue with their lives and even the strange courting rituals that they have to go through because they can't say 'I'm gay' just in case. I highly recommend it and I highly recommend the novel as well. If you've read it or seen it let me know your thoughts! If you haven't seen it follow the link here to watch the trailer. Fantastic movie. A beautifully shot film.